Smart door locks is the newest innovation in home security products. Smart door locks are designed with convenience and safety in mind. Smart locks are operated electronically and don’t require a key to unlock. Smart locks may use remotes or smartphones to lock and unlock a door. 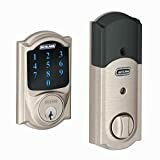 However, are smart door locks truly safe? One major drawback of smart locks is the idea you must use your phone to unlock the door. Certain brands of smart door locks must sense your phone’s presence to disengage. This becomes problematic if your phone is stolen. Not only could the door be unlocked by a criminal with your stolen phone, many smart locks allow you to change door lock codes with your smartphone application. Another issue with smart locks that use phones to unlock and lock is firmware problems. In the summer of 2017, a firmware update caused a malfunction in smart locks produced by LockState. Over 500 customers were affected with 200 of the customers using the locks to manage their rental properties remotely. The company required affected customers to send them the lock for repairs. Some companies have noted Bluetooth vulnerabilities and have added an extra layer of protection with the inclusion of WiFi. For instance, Lockitron can use WiFi to remotely unlock and lock a door or receive notices when the lock’s knock sensor has been triggered. Not only can many smart locks be hacked, but they also are proven to have other vulnerabilities like the ability to be removed with a flathead screwdriver. Since smart locks often work with an existing deadbolt, this may mean they have the same level of security as traditional looks. Some smart locks require the deadbolt have certain specifications before installation. For instance, the smart lock may only work with thumb turn deadbolts and not double cylinder deadbolts. These limitations could make the home vulnerable since the homeowner will not be able to add additional hardware for extra protection. 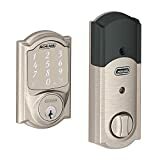 If you do choose a smart lock, it may be best to rely on a version where you can use it as an extra layer of protection for your traditional lock. Plus, depending on what type of power source the lock uses, the lock may become useless during power failures. According to Consumer Reports, smart locks may not be worth the money. During independent testing, they found a $300 fingerprint sensor lock less secure than a keyed lock priced almost 50 percent less. Interested in home security equipment including sensors, cameras and smoke detectors? Contact Protect America today to find out more about their affordable equipment pieces and monitored home security plans. Request a free online quote through their secure web portal.